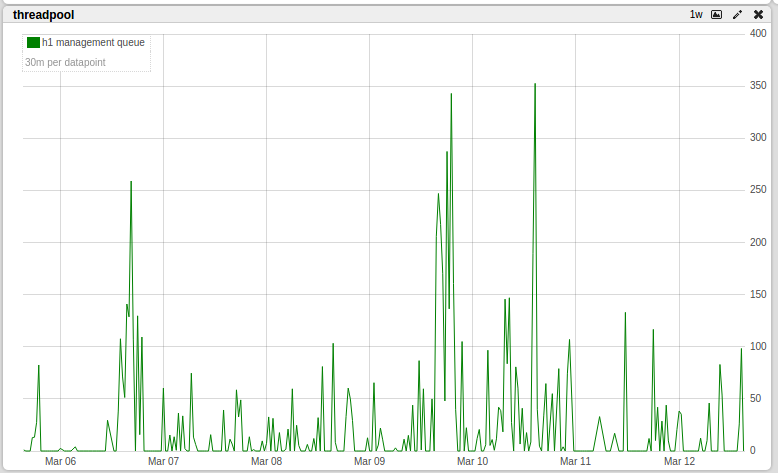 Elasticsearch Users - Are long queues in management threadpool a problem? Are long queues in management threadpool a problem? Has anyone experienced this issue? More importantly, is it a problem? We haven't seen anything bad ... but just in case this is an indicator. * The 1 extra thing we're doing is curling every 10 min to "_nodes/stats" and "_cat/indices" (about 3K indices). To view this discussion on the web visit https://groups.google.com/d/msgid/elasticsearch/4d9ad1e4-1225-4c89-9c70-7f68abc983a5%40googlegroups.com. Re: Are long queues in management threadpool a problem? As long as they don't stay too high then it's not a critical problem. To view this discussion on the web visit https://groups.google.com/d/msgid/elasticsearch/CAEYi1X8gZdfNWz2%2BvsjYh1msCs8ygwSDe%3DFJKZBEutnUtqQwLw%40mail.gmail.com. I guess I'm not sure what's considered too high ... 300 does seem kind of high ... in my mind I'm thinking that due to this the Master nodes might not have enough time to process cluster events (such as mapping updates, alias creations). To view this discussion on the web visit <a href="https://groups.google.com/d/msgid/elasticsearch/4d9ad1e4-1225-4c89-9c70-7f68abc983a5%40googlegroups.com?utm_medium=email&amp;utm_source=footer" target="_blank" rel="nofollow" onmousedown="this.href='https://groups.google.com/d/msgid/elasticsearch/4d9ad1e4-1225-4c89-9c70-7f68abc983a5%40googlegroups.com?utm_medium\75email\46utm_source\75footer';return true;" onclick="this.href='https://groups.google.com/d/msgid/elasticsearch/4d9ad1e4-1225-4c89-9c70-7f68abc983a5%40googlegroups.com?utm_medium\75email\46utm_source\75footer';return true;">https://groups.google.com/d/msgid/elasticsearch/4d9ad1e4-1225-4c89-9c70-7f68abc983a5%40googlegroups.com. To view this discussion on the web visit https://groups.google.com/d/msgid/elasticsearch/03e2d087-9610-44fd-80f5-262aaa2d370a%40googlegroups.com.